This book draws together lively debates from the new economics of transition, commons and well-being, consumerism, and the emerging role of mindfulness in popular culture. Engaged Buddhist practices and teachings correspond closely to insights in contemporary political philosophical investigations into the nature of power, notably by Michel Foucault. The 'attention economy' can be understood as a new arena of struggle in our age of neoliberal governmentality; as the forces of enclosure – having colonized forests, land and the bodies of workers – are now extended to the realm of our minds and subjectivity. 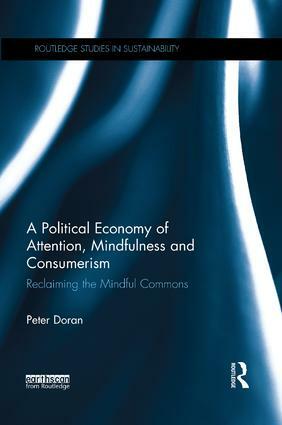 This poses questions about the recovery of the 'mindful commons': the practices we must cultivate to reclaim our attention, time and lives from the forces of capitalization. "A Political Economy is an important contribution to acknowledge that mindfulness and associated mind–body practices are central, not peripheral, to collective liberation (Rowe 2017)." - Benedikt Schmid, Institute of Geography and Spatial Planning, University of Luxembourg. Peter Doran is a lecturer at the School of Law at Queen’s University Belfast, Northern Ireland.